and a great selection of cool audio stuff for your home. We’re Totally Wired in more senses than one. 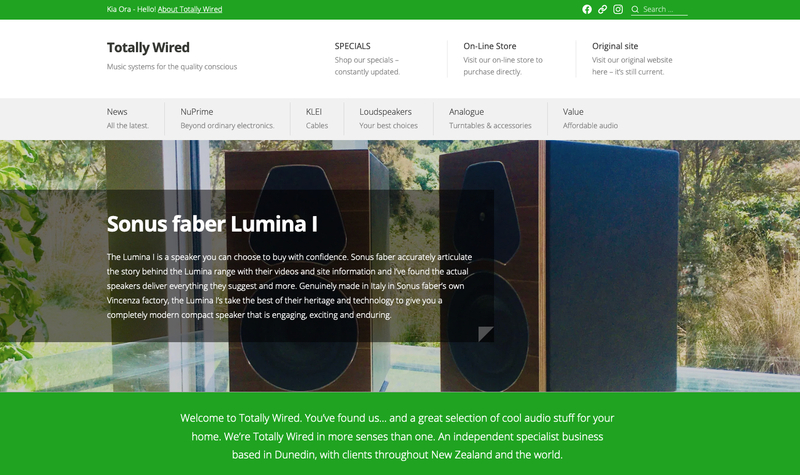 As an independent specialist business based in Dunedin, with clients throughout New Zealand and beyond, no matter where you are you’ll find here some the world’s best offerings in audio. Our carefully chosen range is designed to meet a variety of desires and budgets. You love having good music in your home life? 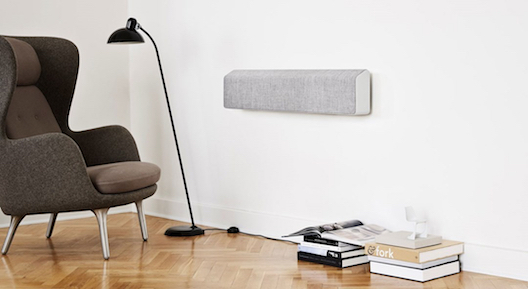 Explore our site and find out how we can make home audio easy. Discover the best ways of listening to music. Make the visuals you enjoy sound spectacular. Tell us what you want and together we’ll select the ideal component or system for you. We’ll organize safe delivery and everything that is required to get you up and running. It will look and sound just dazzling! Totally Wired is more than a retail space. Our web presence has continually grown in tandem with internet use and global connections. Meet Totally Wired 3.0! At the end of 2016 we changed our model to bring you a new, and more adaptable, Totally Wired shopping experience. We moved from the historic Terrace Houses in the centre of the city to our semi-rural base - our third venue. Read more why. You can see on our new website the 21st century internet presence we’re developing. The original website you are currently on still houses much of the product detail. The on-line store carries several items for easy ordering. For you, this all means better access to the information, advice, product and the service you need. We’re here to help. We welcome your visit to us or, for our Otago clients, we are able to visit you in your own home and demonstrate our best products in this context. For all of you outside of Dunedin - we have more time allowing faster and more considered responses. In the last three years we’ve also established two fantastic agencies where we are able to bring you products directly from the designers - the NuPrime range of electronics and the Australian KLEI cables from Keith Eichmann. In both cases we’ve got long term trusted relationships which are also strongly endorsed by our customers. This has meant we were able to step out of the conventional distribution structure allowing us to deliver you with better value, and carry a greater range in stock. To bring you the best in audio we’ve continued to focus on the most outstanding components from - the Well Tempered turntables, Sonus faber speakers, Monitor Audio loudspeakers Stax electrostatic headphones and Pure Audio amplifiers being obvious examples. Plus we are constantly researching and assessing new audio options. And yes, we’re most certainly still your best source for the always popular Tivoli radios and bluetooth systems. All about the awesome NuPrime range of DACs and Digital amplifiers. We're thrilled to be able to bring you the NuPrime products. As longtime NuForce enthusiasts it was only natural for us to contact Jason Lim and ask if we could represent his new enterprise in New Zealand - previously we'd had to operate via a distributor company which was both inefficient and costly. Now the NuPrime range comes to us directly and we've been tasked to do the best possible job for you in New Zealand. In 2017 NuPrime now have a comprehensive range of models that cover both music, surround sound and multichannel. And there is more to come. You'll see that NuPrime, while being primarily active in Digital do have some excellent new analogue components. Every model from entry level upwards offers you a happy mix of both exceptional value and performance. Browse through our pages to learn more. Analogue is more than vinyl. It's music with warmth and realism. There are no sampling limits in analogue. You have the ability to make continual improvements to any analogue system, revealing more music with ever greater fidelity. If you want to rediscover records, or invigorate an existing turntable based system we have some great analogue options for you. Enjoy great sounding record players from Well Tempered Labs,and the new Consonance 'Wax Engine'. Match these with phono cartridges from Dynavector and Nagaoka, phono stages from Well Tempered, Dynavector, Pure Audio. Revel in the analogue glow of all tube amplification with the Dutch PrimaLuna valve amplifiers or the totally modern awesome new amplifiers from NuPrime. Experience New Zealand made state of the art in solid state analogue amplification with Pure Audio. Match either with the beauty of handmade Sonus faber loud speaker systems from Italy. And tie it all together with revolutionary new cables from Keith Eichmann. The KLEI gZero range of interconnects and speaker cables are pure analogue goodness that make any system sound much better - for less than you expect. Wouldn't you love great sound in any room of your home, without the wires or complication of traditional hifi systems? We specialise in systems for the design conscious.Wireless design liberates you from the conventional and allows more ways to enjoy music and video than ever before. All your music and the means to control it rests in the palm of your hand - iPhone, smartphone or tablet. We can make it happen for you. The Scandinavian Vifa range is a great place to start. Want the immersion of quality surround sound? We've got the visuals and multi-channel covered with the best in BluRay players, state of the art multichannel amplification and speaker systems to match - built in and hidden or aesthetically pleasing arrays to suit both your room and listening requirements. In this often detached world you may find it comforting to know that we are an owner operated business. You will deal with people who can answer your questions and find solutions. Our website is written to provide you with helpful information. If you know what you want you can quickly and easily contact us to make your order. Like many specialist NZ retailers there’s more to Totally Wired than simply running a business. Read About Us if you would like to know who you’ll be dealing with; see the details on Buying from us; visit our on–line shop; find us on our Contact page; read what some of our Customer’s think.